In today’s world of insurance sales, you need the right technology, or you’ll be left behind. Especially as more agents and agencies invest in telesales. American Insurance Organization provides you with a customizable agent/agency website, allowing you to build a web presence. You can personalize your website by changing the look, feel, content and images, using your own personal logo and more. 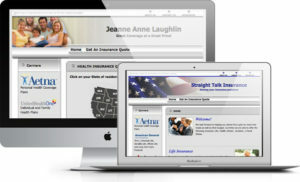 Prospects are able to learn about insurance, and the products and carriers you represent. They can request more information, obtain a real time quote and even apply for coverage online. With AIO, agents have access to technology that automatically responds to quote requests and continues marketing to those prospects using automatic drip marketing campaigns.